R2005, Patrick O'Connor. 36", E. Medium orchid falls suffused white near center and white standards veined medium orchid, especially near outer edges. Style arms are cream with a distinct green cast and orchid on either side of the midrib. Yellow thumbprint signal with an orange center line becoming wine red and extending almost to outer edge of falls. Irregularly ruffled flower. An early bloomer. 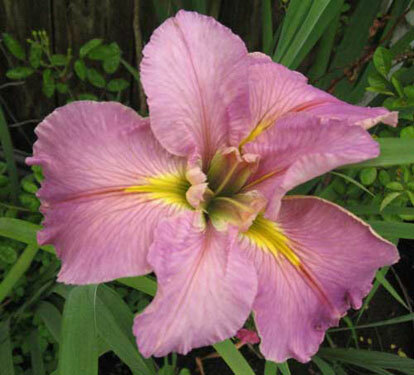 (Shizuoka Sunrise x False River) X Bubble Gum Ballerina.